A staff member or student worker will be available at the Help Desk in the Lenfest Learning Commons of the John Stewart Memorial Library during normal Help Desk hours. However, due to resource limitations, on occasion there may be times when they need to leave the desk to assist others or to complete departmental projects to improve the level of service to the Wilson community. If you need to work directly with someone face-to-face, it is best to call the Help Desk to confirm availability or schedule an appointment. What are the Help Desk's normal working hours? The Help Desk is available Monday through Thursday from 8 a.m. to 7 p.m. and Friday from 8 a.m. to 5 p.m. The Help Desk is closed on days when the College is closed for holidays and breaks. The web client is a complete client version of the Help Desk software. It allows you to submit an incident, submit a request, and check the status of your ticket. Login using your Wilson login (same as for your computer or email) id (firstname.lastname) and password. Click "Submit an Incident or Request"
Complete the form and click "Submit". 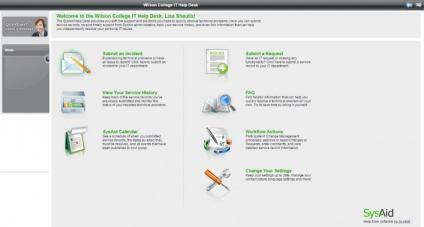 Launch the web client and click on "View Your Service History". You will be able to view your current and past tickets for an up-to-date status. Click on the ticket to see the detailed notes. If you want to send a message to the technician, simply click on "Add Note" on the right.